Are Shipping Numbers Masking A Stealth Commodities Selloff? 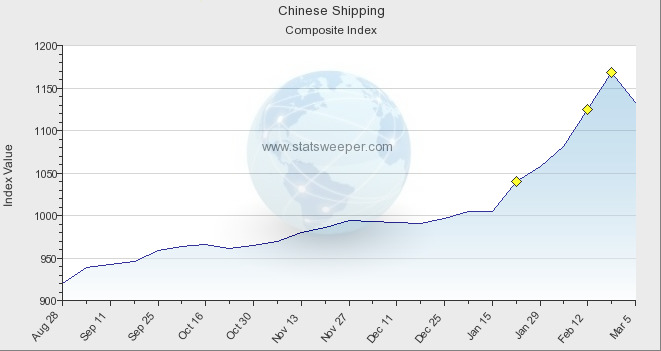 The China Containerized Freight Index has bee-lined upward in 2010. 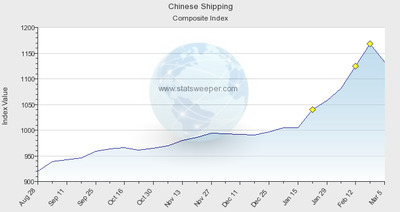 The index tracks shipping prices for goods sailing from China to 11 different regions around the world. Between January 15 and February 26, the index rose 17%. During the same period, the Baltic Dry Index (which tracks average shipping prices globally) fell 18%. As I mentioned, these numbers suggest a big increase in goods being shipping from China relative to the rest of the world. With anecdotal evidence that at least some of the exports were metals. The fear being that Chinese metals stockpiles are being drawn down and re-exported. Potentially weighing on global prices. 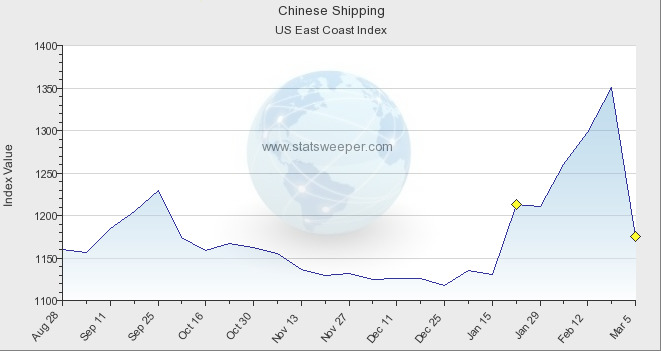 But the upward pressure on shipping prices relented a little this past week. The China Containerized index fell 3%. The first decline since December 18. And the largest since early in 2009. Here’s the interesting thing. Most of last week’s decline was due to falling rates on just two of the CCFI sub-indexes. 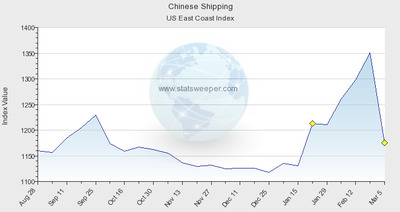 Eastern and Western U.S.
Rates for shipments from China to Eastern U.S. fell 13%. Rates for the Western U.S. plunged 12.3%. 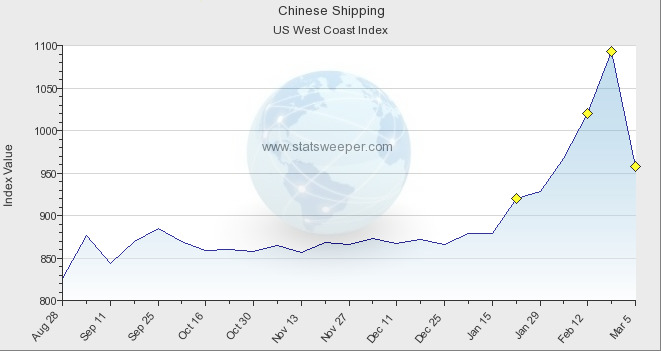 As the charts below show, the U.S. routes have been a major contributor to rising Chinese shipping rates. That trend may now be reversing. What’s the explanation for the rise and fall? Many businesses in the west have recently been re-stocking inventories drawn down through 2009. Last year, with the financial crisis looming, businesses were uncertain whether to build up new inventory. Managers didn’t know if there would be a market for the products. But with the world economy seemingly in recovery in 2010, businesses have been restocking. Undoubtedly contributing to the rise in shipping. This has created a quick-glut of demand for many products, including metals. Almost certainly providing a boost to prices. But this lift is temporary. By many reports, re-stocking is almost complete at most businesses. 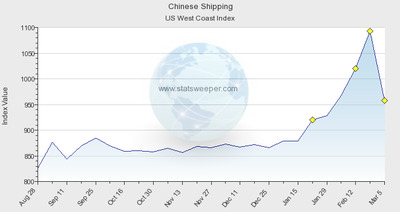 Perhaps explaining why shipping rates started to fall last week. The key will be to see what market prices settle at without the upward influence of inventory building. And whether companies can actually sell the inventories they have built this time around. Some price drivers are forever. And some come and go. It’s important to recognise the difference.